I’ve had a powerful childhood memory lately that I wanted to talk about. Recently, I’ve begun taking paper notes again in a notebook. I’ve started doing this because I find that it helps me gather my thoughts better as well as work out some emotions that I would otherwise have to stymie due to the environment that I work in. It’s not an environment which is conducive to good mental and emotional health. As I started writing these notes, I was using the type of pen pictured at the left. It’s the exact kind my grandfather, Leonard, used to keep in his shirt pockets. He wrote with them all the time in a little notebook he’d also keep in his pocket. The pens are really nice considering how inexpensive they are. They are lightweight, have a wide, 0.7 mm ball point, and the blue ink is absolutely brilliant. It’s very legible even with my chicken scratch that I use. As I began to write more and more in my notebook at work and at home, I began to notice the smell. 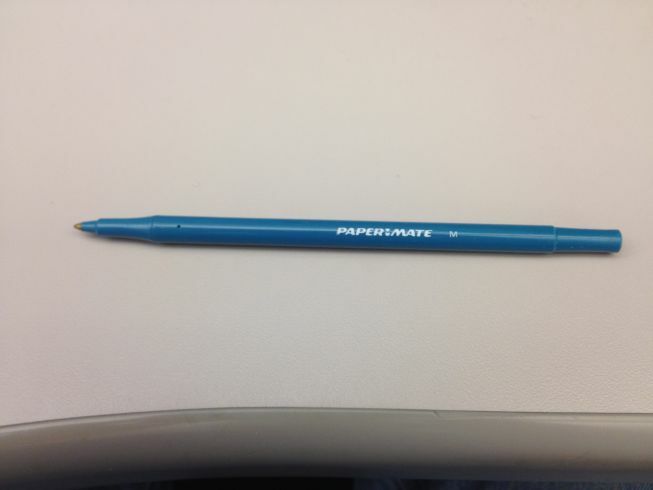 The ink that PaperMate puts into this pen must be an old style ink that is designed to stay on the page and not smear like most of the newer inks these days do. It’s got a strong, industrial type smell that reminds me of old style print shops that used to run gigantic loads of copies, books, stationary, etc. For those of you reading this who are from my hometown of Americus, Georgia, you may remember Gammage Print Shop in downtown on Lamar Street across fnrom where Halstead Chevorlet used to be. This ink smells very much like what Gammage Print Shop used to smell like back when they had the old style printing presses. My grandfather used to scribble all kinds of stuff into his little green notebook that he kept in the breast pocket of his short-sleeve, light blue button down shirt. Shopping lists from Granny, schedules, addresses, phone numbers, you name it. He would write just about everything in this often tattered and well-used 3×5 top-spiral notebook. He’d write in it so often, that one could often smell the ink on his person. It was especially prevalent after you shook his hand. It was just one of his features. Anyways, these happen to be the pens my office stocks in the office supply cabinet on the east end of the third floor where I work. I didn’t think much of it at first when I first grabbed one. I used it occasionally to scribble on Post-Its, sign my name to documents, etc; just little stuff. Then about a month ago, I started keeping a journal at work of my daily activities, reminders to myself, to-do lists, thoughts and feelings that I was experiencing, just trying to unpack what clogs my brain from 8:00 AM to 5:00 PM. As I continued to write in my own notebook more and more, I began to notice the smell. The first time I noticed it, I recognized it right away. I had a strong memory of my grandfather taking out his notebook to write down some things that my grandmother wanted from the grocery store for the kitchen at the Americus Country Club where she worked. Once I started running through this memory in my mind, I briefly stopped what I was doing. I allowed myself the brief moment to just return to 1990 or so and remember good childhood memories. I smiled, recalling a time before I had bills to pay, work to do, people to answer to other than my mom and grandparents. Then my phone rang. It was time to get back to work. The memory faded and I dove headlong into the needs of another non-profit. I write with that pen everyday now. I’ve finally amassed so much stuff in that notebook that I smell the ink when I open it. I smell the ink when I start to write the pen. All the while, I can hear my grandfather telling me, “keep your nose clean.” I sure do miss my grandfather.